Marmorhaus in Berlin was built in 1912/13 by Hugo Pál - one of the eldest cinema buildings in Germany. It opened in 1913 and had 600 seats. The name Marmorhaus - Marble House - came from the marble front. It looked also great inside with an unique expressionistic design. It was really an awesome building at Kurfürstendamm, one of the most famous avenues in Berlin. The cinema closed in 2001, after a renovation in 1998. At Kinokompendium you can see pictures from this cinema in 2000. 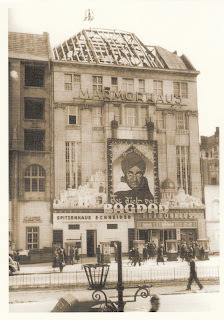 The cinema advertises the movie Der Dieb von Bagdad - The Thief of Bagdad - the 1940 British Technicolor film produced by Alexander Korda and directed by Michael Powell, Ludwig Berger, and Tim Whelan. The film starred Conrad Veidt and child actor Sabu. A second hall at the cinema Lichtburg in Essen is called Sabu - in memory of him. My father loved this movie. The postcard is from 21st century and an old photo. There is written "Richtfest 1940 - topping-out ceremony" on the postcard. But this isn't correct. The cinema opened in 1913. The movie The Thief of Bagdad was never shown in Germany during the Nazi-era. Conrad Veidt migrated to Britain in 1933. There he starred in the title role of the original anti-Nazi version of Lion Feuchtwanger's novel, Jew Süss in 1934. And he played Major Strasser in Casablanca. There were reinstatemant works after war in 1948/49 (look at the neighbour houses). 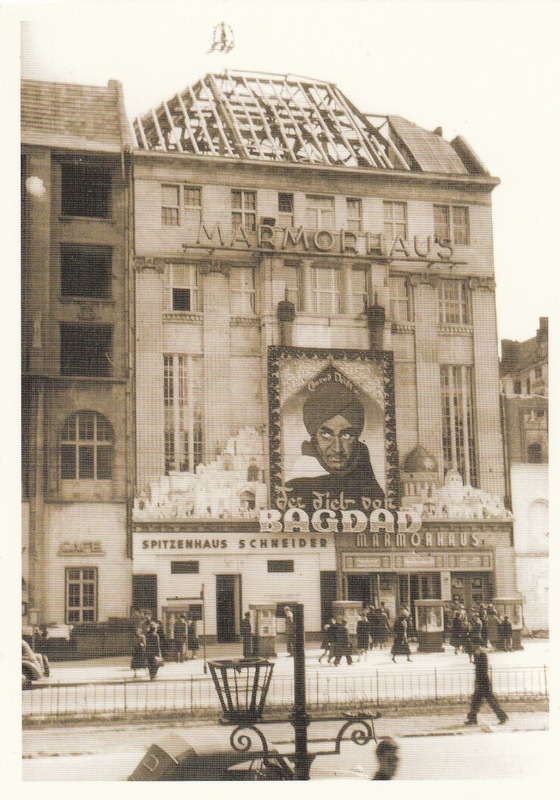 And the movie Der Dieb von Bagdad - The Thief of Bagdad realesed on 4th August 1949 in West German cinemas. So I think the cinema reopened with this movie.